If you want to escape the Buffalo winters, head north. 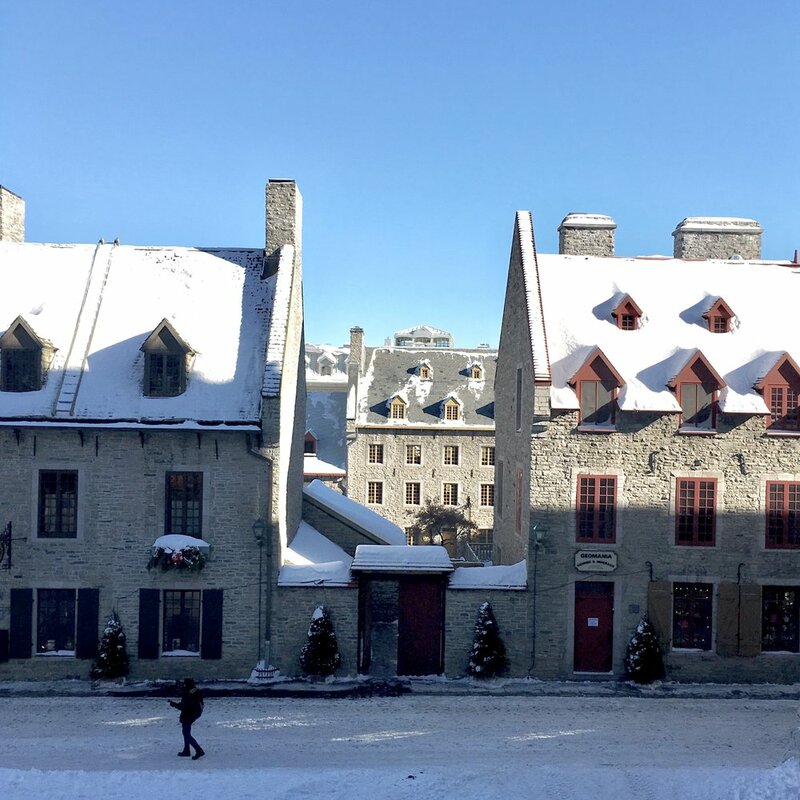 Wedged between the Saint Lawrence River sits a Canadian gem defined by its sloping streets, cobblestone allies, and colonial architecture. Québec City is an 8 hour drive from Buffalo, and its European atmosphere is hardly clouded by the below freezing temperatures experienced while visiting last week. Québec City is one of North America's oldest cities, with a French, Irish, and Algonquin influence. Our travels led us to Québec City's annual winter festival, Carnaval de Québec. The two-week long celebration takes place in one of Québec City's busiest neighborhoods. Daily events run from afternoon until evening and ice sculptures and vendors line the busy streets. It may have been the Caribou (a Québécois warming drink composing of red wine, whisky, and maple syrup), or an overall sense of community felt during this celebration, but it was easy to forget the frigid forecast in this storybook scenery. My travel companion and I stayed in Saint Jean-Baptiste, a 10 minute walk from the view seen above. Our Airbnb was tucked away on a cobblestone street lined with row houses. We chose it due to its proximity to some of Québec's most notable spots, but also because of its airy, bright interior. This gorgeous space is a two bedroom upper with a full kitchen, rain fall shower, deep bath, large living space, bright light, and a beautiful view of the city and distant mountains. Saint Jean-Baptiste is a modern neighborhood with historic touches. It's not an exaggeration to say that every restaurant and bar we visited was worth the 8 hour drive up. Le Projet was our first stop for food the night we arrived in Québec. We settled into a shared table, taking in the incredible crowd on a 3 degree Thursday night. Le Projet is a bustling spot, and even prospective drinkers must wait to be seated at the bar, rather than simply making room for themselves. We enjoyed to-die-for burgers, ciders, and house brews. The interior is cozy, intimate, and bright with service to match. Their beer list is extensive and unique. Our only regret was not being able to enjoy the atmosphere for a second time during our stay. In the summer, this spot opens up a lush courtyard for drinking and dining. In the winter, however, the atmosphere darkens and turns into a busy, warm pub. We visited Le Sacrilège twice on our trip. The friendly bartenders, equally friendly patrons, and homey feel drew us in and kept us there for hours at a time. Le Sacrilège turns from neighborhood pub to young weekend hub in a matter of hours. We managed to experience both. 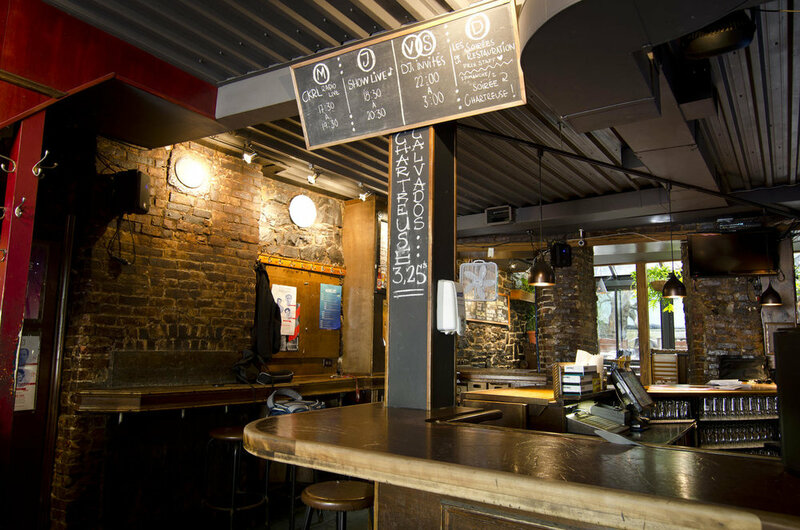 If you travel in search of beautiful spaces, venture to Saint Henri in Québec's Saint Roch neighborhood. This bright and modern roastery and coffee shop was a 20 minute walk or 5 minute Uber from our Airbnb. This was a planned aesthetic pilgrimage. Saint Henri's minimal menu highlights their strength in coffee and tea selections, as well as a popular doughnut indulgence. We sipped on green tea and London Fogs amid the Northern Canadian chill. It's easy to get sucked into the lifestyle in Québec. Lives move slower in the winter, even compared to Buffalo. There is no hurry to salt the roads, or plow the side streets - The locals welcome the slowness, as did we. At Saint Henri, we embraced the opportunity to relax and observe, even just for a moment. We explored a 4-story thrift store about 4 blocks away from Saint Henri. Le Comptoir Emmaus shows a different side to Québec. The drafty building is a vintage seeker's paradise. An entire floor of kitchenware evolves to appliances, records, and collectibles. Emmaüs's thin staircases snake their way from one floor of treasures to the next. Navigate through racks of vintage and retro clothing, old fur coats and hats, skis, snowshoes, dining sets, couches, and memorabilia. If you're looking to separate from the usual tourist strips, Le Comptoir Emmaüs is a welcomed detour. Our journey naturally led us to Old Québec. The original limits of the city are guarded by a large, well preserved stone wall. To enter Old Québec is truly to take a step back in time. The streets are lined with colonial houses, gorgeous French-inspired architecture, and some of the oldest pubs in North America. We visited their stunning, bright Basilica, learned Québec's history at the Museé de la Civilisation, and strolled down the old one-ways. The deep blue tones from the temperature permeated Old Québec. I never thought that the air could have such an effect on photographs. Our holiday was brief. Two days spent traveling with less than 72 hours left to explore our northern neighbor. In that time we visited multiple spots for food, drinks, shopping, and sites. Jupon Presse is a sweet boutique in Saint Jean-Baptiste. Handmade jewelry, trendy clothing, ceramics, and delicate lingerie are a few of the unique finds tucked away in this small shop. Bols et Poké serves piping hot ramen, nourishing bowls, and fresh poké. This bright Saint Jean-Baptiste space is also a popular spot for smoothies, although in below freezing temperatures - we opted for soup. Le Hobbit is a cozy spot with hearty meals. The lengthy story of Le Hobbit's location and namesake is interwoven within Québec's history, however its obvious homage to Tolkien is not misplaced. Le Hobbit is appropriately described as a "friendly, unpretentious little bistro is truly to the image of the character Tolkien. In spite of being small, it carries with it the greatness of a story whose echo is heard still today during coffee breaks." We enjoyed a slow and filling brunch - certainly fit for a Hobbit. Even in our brief visit, Québec insisted that we take our time through its unique pockets. Travel slow, take it in, eat well, and enjoy.